If you neglected to maintain it at the end of last summer, this is a good time to check your mister system and prepare it for the upcoming summer. The first thing to do is replace the mist system sediment filters on your system. If you have a second set of filters, such as one for hard water, replace that too. Tighten and examine the fittings to make sure they’re tight and secure. Hook up the system, then test the pump (or water supply) to check that it’s working. If your water pump requires lubrication, examine it and oil it according to the pump’s instructions. Examine the electrical connections to ensure they’re secure and check the insulation on the wiring for cracks, replacing any that have worn out. Now fire up the pump and follow the length of the mister system hoses, examining it it for leaking. If your mist system makes use of SS mist tubing, this won’t be much of a problem. Simply check out the joints and fittings for leaks. Tighten up any connectors that may have come loosened. If your system has nylon tubing, you’ll want to inspect the entire system for splits and breaks. Check the misting system for leaking misting nozzles. 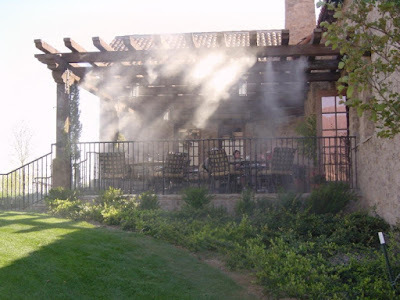 Misting nozzles that drip profusely are most likely to be worn out and need to be replaced. Clogged nozzles will have no water running from them, or a little spray and maybe some dripping. After you’ve turned the system off, replace the defective nozzles with new high-quality mister nozzles. Make sure they have the same size orifice as the old ones. Remove the blocked nozzles and check for crud in the fixture and also in the base of the nozzle. If the passages are clear, then check the nozzle orifice on the front of the nozzle. If you dwell in a locale that has heavily mineralized water, the mist nozzle may be clogged by calcium. If there are calcium deposits on the face, gently scrape the deposits off being careful not to damage the pinhole. It may be possible to simply just scrape the debris off the surface of the misting nozzle. If it appears the orifice is internally clogged, it may be possible to dissolve the blockage by soaking the nozzles in lime remover overnight. Checking and cleaning nozzles is time consuming and might not clear out all the clogs. For the time taken in trying to fix the nozzles, it may be more cost efficient to just replace all the nozzles at once. If your system uses AmFog mist nozzles, you can figure out the thread size by the pattern on the side of the nozzle – cross hatches indicate 12-24 thread, while straight up and down grooves indicate 10-24. The color of the o-ring on the AmFog nozzles tells you which orifice it has. Be sure you’re looking at the o-ring on the nozzle itself, not the o-ring on a nozzle extender or anti-drip body. Now that you’ve taken care of the maintenance on your misting system, it’s time to start enjoying a cooler summer!